DO NOT BUY TICKETS FROM ANYWHERE OTHER THAN THE OFFICIAL WEBSITE waterfrontconcerts.com. Any time you purchase tickets from a third party (a friend, ticket-reselling website, ticket broker, etc. ), you risk getting scammed, and are not guaranteed entry into the venue. When you click the link to buy tickets from the official website, you will be taken to the event’s official ticket retailer — Ticketmaster.com. At checkout there will be additional charges for taxes, service fees and shipping depending on your location. These charges will be clearly indicated before you confirm your order total. IF there is an issue with your ticket while entering the venue you will need a picture ID to confirm your Ticketmaster account. We cannot make any changes to an account without the account holder present. FlexPay serviced by Klarna, offers you flexible payment options within Ticketmaster checkout that allows you to make payments over a period of time. To learn more, please click here for more info *Only purchase amounts that qualify will be offered in the FlexPay payment options. *Must be 18 years or older. This is a standing only area. No chairs are allowed in this area. PLEASE NOTE: Prices shown DO NOT include shipping and fees and are subject to change without notice. This is a standing only area. No chairs or blankets are allowed in this area. This is an exclusive general admission viewing area located on the left side of the stage. NOTE: The 2-DAY Festival Ticket and 2-DAY Credential are non-transferable and must be on your person AT ALL TIMES for the duration of the festival in order to gain entry. If lost, there will be no replacements available. NO TICKET OR CREDENTIAL = NO FUN! This is a Poser/Elevated Side stage preferred viewing area. Access is limited during certain performances, due to safety compliances. 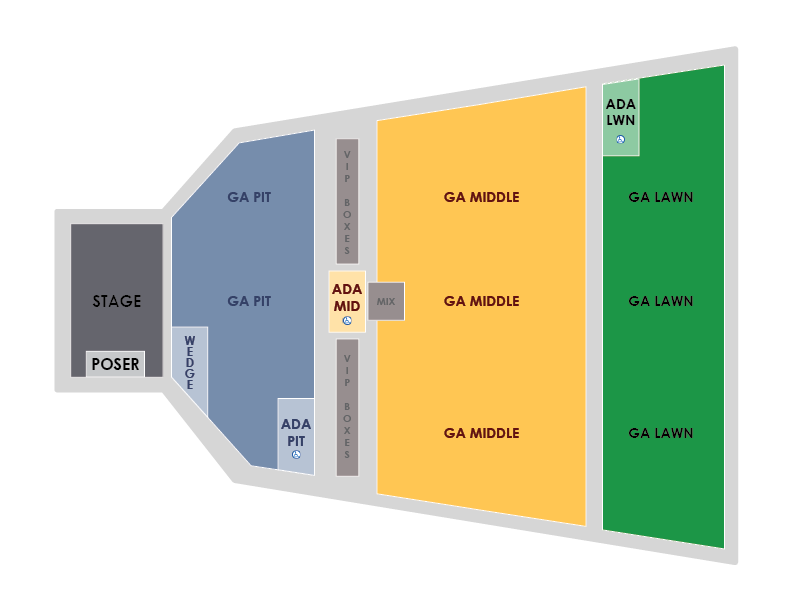 For your safety, you may be required to relocate to the General Admission Wedge section for a period of time. For all of you diehard #ImpactMF we will once again be offering hotel and metal camp packages for the festival weekend. No chairs or blankets are allowed in this area. This is a standing only area (refer to seating chart above). No chairs or blankets are allowed in this area. • Two passes for 2-DAY access to the exclusive “Private Lounge”. Please note: Package details subject to change without notice. Your 2019 Impact Music Festival Tickets Credentials will be available for pickup at your hotel upon check-in. CHECK-IN LOCATION & TIME INFORMATION WILL BE EMAILED OUT BY WATERFRONT CONCERTS 30 DAYS PRIOR TO THE DAY OF THE SHOW. All packages are will-call only. All packages are NON-REFUNDABLE outside the first 72 hrs. of purchase. All sales are final. You must bring a valid PHOTO ID matching the PURCHASER/ATTENDEE NAME on your order. Those who cannot present a photo ID matching the PURCHASER name on the order will be turned away. IMPACT Music Festival VIP Packages CANNOT BE RESOLD. There are no age restrictions for this event. If you have ACCESSIBLE needs: please call or email our customer service representatives 1-800-745-3000 as soon as you have placed your order, and we will do our best to accommodate your needs based on availability.